NASA's Mars rover Curiosity may have to choose a new route to the base of a huge Red Planet mountain. The 1-ton Curiosity rover had been heading for Mount Sharp -- a 3.4-mile-high (5.5 kilometers) mountain in the center of Mars' Gale Crater -- via "Hidden Valley," a sandy swale that's about the length of a football field. But Curiosity turned back shortly after entering the valley's northeastern end earlier this month, finding the sand surprisingly slippery, NASA officials said. There is no way out of Hidden Valley save exits at its northeastern and southwestern ends, NASA officials said. The mission team is now assessing possible alternative routes that would take Curiosity north of the valley. The goal is to get Curiosity to Mount Sharp, which has been the rover's ultimate science destination since before its August 2012 touchdown. Mission scientists want the six-wheeled robot to climb up through the mountain's foothills, reading a history in the rocks of Mars' transition from a warm and wet planet in the ancient past to the cold, dry world we know today. The chief goal of the $2.5 billion Curiosity mission is to determine if the Red Planet could ever have supported microbial life. The team has already checked off this goal, finding that an area near Curiosity's landing site called Yellowknife Bay was a habitable lake-and-stream system billions of years ago. Researchers came to this conclusion last year after analyzing samples Curiosity drilled from two different rocks in Yellowknife Bay. Curiosity departed Yellowknife Bay in July 2013, embarking on the long drive to Mount Sharp. The rover drilled another rock sample along the way in May of this year, and it's now sizing up a fourth potential drilling target, mission officials said. That rock, known as "Bonanza King," lies at the northeastern end of Hidden Valley. Studying Bonanza King could help the mission team better understand the geological context of Gale Crater, officials said. 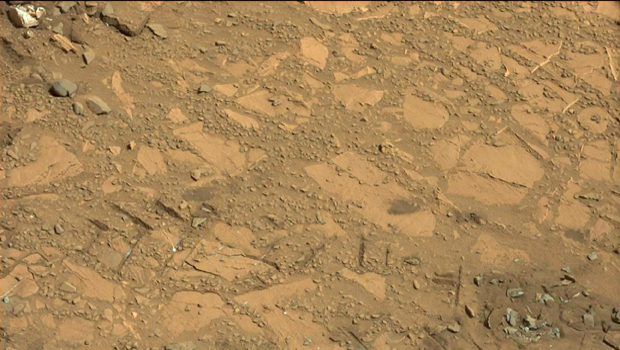 "This rock has an appearance quite different from the sandstones we've been driving through for several months," said Curiosity deputy project scientist Ashwin Vasavada of JPL. "The landscape is changing, and that's worth checking out." Curiosity has covered about 5 miles (8 km) on the long trek to Mount Sharp thus far and still has about 2 miles (3.2 km) to go. The rover team hopes to get to the mountain's base by the end of the year. The epic drive has been complicated and prolonged somewhat by unexpected wheel damage, which Curiosity began to accrue late last year. The rover's operators adjusted Curiosity's route in an attempt to avoid hard, sharp rocks and have driven the rover backward part of the way. These strategies have helped get the problem under control, mission team members said.